How Do I Keep The Clothes In My RVs Closet From Falling On The Floor When Driving? After driving my RV, I find all the hangers have fallen off the rod in the closet and the clothes on the floor. How do I keep the hangers in place? ANSWER: This is a common problem that a lot of RVers face. You’re all excited when you get to your campsite and decide to change into different clothing and go to the closet in the RV only to find all of your clothes in a giant wrinkled pile on the closet floor. Please hang in there (sorry I could not resist) because believe it or not there are actually clothes hangers that are designed for use in RVs. They are called Tri-Lynx Trailer Camper Laundry Stay-Put Clothes Hangers (pictured at the top of this page. These hangers have an innovative clip-on design that stays put on your RV's closet bar. 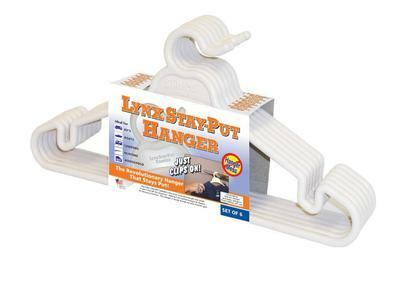 These super heavyweight poly hangers are designed to grip the closet bar so they won’t bounce off while your RV is moving. This helps keep your clothes neat and off the closet floor. They are actually sturdy enough for your heaviest garments. There is no extra hardware to purchase or install, since they work with your existing closet hardware. There are also velvet covered hangers (also known as Huggable Hangers) pictured above. The velvet covering helps prevent clothes from slipping off of the hangers. Another advantage to velvet covered hangers is that they take up less space in the closet. Hopefully, these tips will help keep your clothes hanging in there. If any of our visitors have other tips or suggestions for you they can add them to this page by clicking on the "Click Here To Post Comments" link located near the bottom of this page. Comments for How Do I Keep The Clothes In My RVs Closet From Falling On The Floor When Driving? Someone was asking for shorter hangers to fit in shallow closets. Here's a good place to find them. They are 15 inches long, and some have rubber strips to keep clothes from falling off. You can also cut a pipe cleaner in half and wrap around top corners of hanger to keep clothes on the hanger, and then hang every other one different direction that also helps. Our first trip in our new travel trailer our clothes were on the floor. I changed all our hangers to those Huggable Hangers (the thin ones with the velvet feel to them). They take a little bit to get used to at first however after hanging a few items they are awesome!! It also makes it a lot easier transferring our clothes from the house to the camper and vice versa. They are also very sturdy. Hope this helps!! Happy camping! These are great ideas. I'm going to try the pool noodle one. Probably cheap and easy. I've seen them at many stores. If you have any wire hangers , take your regular hangers and pair them up with a wire hanger going the opposite way, so there is a hook on both sides of the closet rod. this will prevent the hangers from falling, as far as the clothes go you can use clothes pins to attach your clothes to the hangers. We use a pool noodle or insulation sleeve sliced long way and pressed over the hangers on the rod. Never had any problems with hangers jumping off the rod. Easy to pull noodle or sleeve off rod when we stop. lightweight too. I have seen ribbed plastic tubes that slide over the closet bar and keep hangers in place in some RVs. They solve the problem. The only other problem is I can't find them anywhere. Anyone know where to get them?? Thanks. How do you keep dishes and food items safe on open-style shelves when driving an RV? Sometimes it's not the clothes falling off the hanger that is the problem, but the entire hanger, clothes and all, that drops to the floor when the RV is traveling down the road. Even pinning the clothes to the hanger won't help that problem. Hangers need to stay put. This is just the ticket; and since they are not attached to the rod, they are versitile and can be taken with you to a new RV if needed. Why not save money and not buy gadgets? I see no reason to buy new gadgets when you can modify existing ones. If you use standard wire coat hangers, you can easily bend the hook end closed enough so that the doesn't bounce off whichever type of hanger holder your particular rv has. If certain items slide off the hangers, clothespins work well to hold the clothes on the hangers. If certain items get "hanger shoulder" dents in them, I've seen modifications made to the hangers such as cushioning added to them. You can likely google "diy cushioned hangers" and find the instructions to make them. I hope these simple solutions help.